Keywords – Co-design, Collaboration, Design for Services, Organisational Change. Relevance to Design Practice – The study provides empirically grounded guidelines for developing the methods and practices of service co-design towards greater leverage and viability. The results can be utilised by practitioners when designing for services in complex real-life contexts. Citation: Pirinen, A. (2016). The barriers and enablers of co-design for services. International Journal of Design, 10(3), 27-42. Received December 18, 2015; Accepted August 12, 2016; Published December 31, 2016. Copyright: © 2016 Pirinen. Copyright for this article is retained by the authors, with first publication rights granted to the International Journal of Design. All journal content, except where otherwise noted, is licensed under a Creative Commons Attribution-NonCommercial-NoDerivs 2.5 License. By virtue of their appearance in this open-access journal, articles are free to use, with proper attribution, in educational and other non-commercial settings. Antti Pirinen is University Lecturer in Spatial and Service Design at Aalto University’s Department of Design and is a member of the ENCORE (Engaging Co-design Research) team. He holds a Doctorate of Arts in Spatial Design. His current research interests include co-design, user-centred design and conceptual design in the case of housing, the built environment and related services. The growing scale and complexity of design problems has engendered a move towards more open and collective design activity where multiple stakeholders, particularly the end users but also professionals from other fields, are included as equal partners in the design process. Co-design, defined by Sanders and Stappers (2008) as the “creativity of designers and people not trained in design working together in the design development process” (p. 2), reflects a shift of focus from products to broader human goals and propagates the ability of design to tackle complex societal problems. At the same time, Western societies are moving into service-based economies. To improve their competitiveness in conditions characterised by diversification of customer needs, immaterialisation of products, flexible manufacturing methods and co-creation of value, businesses are shifting from goods-dominant to service-dominant logic, where services offered to customers in continuous interaction with them become the means of value creation (Lusch & Vargo, 2006). In this situation, service design has emerged as a new area of design practice and research that brings the user into the centre of the development of services (Kimbell, 2009; Mager, 2008). From its early focus on service touchpoints, service design has expanded towards ‘designing for services’ in broader multi-actor service systems where it can have more profound, transformative effects to organisations and people’s lives (Meroni & Sangiorgi, 2011; Stickdorn & Schneider, 2010). The public sector, such as healthcare and social services providers, has begun to adopt approaches from (collaborative) design for services (e.g. Design Commission, 2013; Keinonen, Vaajakallio, & Honkonen, 2013). Thus, service design and co-design are gaining importance as part of the public innovation system. They can be applied for public policy making and implementation (Bason, 2014; Junginger, 2013) or in cities for addressing topics related to the urban environment and its services that are beyond the scope of the urban planning process (Design Driven City, 2015; Fuad-Luke, 2012). As co-design for services is increasingly utilised by public and private organisations, more knowledge is needed on the method-related, practical, organisational and other factors that impact its effectiveness and play a part in its diffusion. To gain a more structured and comprehensive understanding about the barriers and enablers experienced in cross-organisational service co-design endeavours. To increase the knowledge on the role, advantages/disadvantages and effectiveness of specific methods and skills in facilitating co-design for services. The study seeks to contribute to research and practice. It complements previous research through a cross-project analysis, with a focus on service co-design methods and skills. As a practical outcome, learnings from the case projects are brought to a broader audience, providing guidelines for developing the methods and practices of service co-design towards more leverage and viability. The paper begins with an overview of previous research from the fields of organisation studies and design, after which the case projects and the analysis method are opened up. The main findings are presented as 20 barrier-enabler couples, explained with the help of the data. The implications to design research and practice are discussed in the conclusion chapter. The nature and prerequisites of collaboration are a widely researched topic in organisation and management studies (e.g., Gray, 1989; Huxham, 1996; Kanter, 1994). It is acknowledged that a combination of viewpoints enables the parties to see beyond their own limited vision, increasing the potential for innovation and creativity in what Kanter (1994) calls ‘collaborative advantage’. However, it has also been recognised that organisations and their members resist change and external impacts—individuals because of habit, need for security or fear, and organisations due to structural inertia and threats to expertise, the power hierarchy and resource allocation (Robbins, 1991, p. 639-643). Collaboration requires a change of organisational culture, which is slow and difficult, especially on a level which addresses underlying values and assumptions (Gagliardi, 1986; Schein, 1985). Collaboration is typically realised by temporary multidisciplinary teams (“adhocracies”, Mintzberg & Mintzberg, 1988, p. 182), which are fragile and need a lot of management support to survive (Axelsson & Axelsson, 2006). Co-design for services necessitates working across organisational, sectoral and jurisdictional boundaries and divergent realms of knowledge or “thought worlds” (Carlile, 2002; O’Flynn, 2014). The ability to build new “boundary-spanning” practices that draw on diverse bases of expertise has been identified as a key competence in organisations. It requires “boundary spanners-in-practice”, agents who engage in negotiating the boundaries of diverse fields to create new joint fields of practice (Levina & Vaast, 2005). Carlile (2002) and O’Flynn (2014) also stress the role of shared ‘boundary objects’ (see Star & Griesemer, 1989), such as diagrams or other simplified visual representations in aligning of interests, transfer of knowledge and learning across boundaries. Boundary objects are plastic enough to be perceived and used differently by different actors, yet commonly understandable across social worlds. Previous research lists a number of obstacles to inter-organisational, intra-organisational and inter-disciplinary collaboration in the public and private sector as well as means to overcome them (Axelsson & Axelsson, 2006; Huxham, 1996; Kanter, 1994; O’Flynn, 2014; Widmark, Sandahl, Piuva, & Bergman, 2011). The impediments include rigid hierarchies, prejudices and mistrust, conflicts of interest, a lack of clarity about common goals, differences in organisational culture, poor allocation of responsibilities, a lack of resources and management, a lack of commitment or incentive, and discontinuity. Correspondingly, equality, trust, common interests and goals, facilitation, accountability and budgeting, managerial support, formalised support structures and continuity can promote collaboration. The “power and politics” aspect of collaboration (O’Flynn, 2014), somewhat overlooked in the management field, is evident in the public realm, especially in healthcare and participatory urban planning (e.g. Till, 2005). A Swedish study on the obstacles of collaboration between healthcare, social services and schools in an urban district identified lack of confidence and problems in the way the professionals encounter each other, such as inequality and territorial thinking, as major barriers (Widmark et al., 2011). The authors stress the value of creating a “holding environment”, an open and equal social context that reduces disturbing affect and facilitates common sense making. This resonates with the goals of co-design events and empathic design. In university-industry collaboration, the different incentive systems and nature of knowledge create a barrier that can be mitigated by experience, using a variety of formal and informal interaction channels and building trust (Bruneel, D’Este, & Salter, 2010). As for internal obstacles, inter-unit collaboration in large companies in a study by Hansen and Nohria (2004) was hampered by unwillingness or inability of people to seek input and learn from others or to transfer knowledge. To avoid this, management should integrate collaboration into leadership, values and goals, hire people with collaborative tendencies and offer ways for best-practice transfer and for the cross-pollination of ideas. To sum up, in the light of organisation and management studies, collaboration is a transformative capability that necessitates the crossing of the structural, cultural and other boundaries of individuals, organisations and networks and can be supported by strategic, operational and cultural integration, by the creation of trust and through the recognition of mutual value among the actors. Next, these insights are brought into focus by illustrating them using more method-specific experiences drawn from design research and practice. Co-design for services among multi-disciplinary networks of stakeholders constitutes a particular case of cross-organisational collaboration that is characterised by human-centredness and utilisation of designerly methods and tools to acquire contextual knowledge, to bring the actors together and to create and visualise new viable solution ideas. There is a considerable amount of literature about the characteristics as well as the benefits and hindering factors of applying design in organisations. 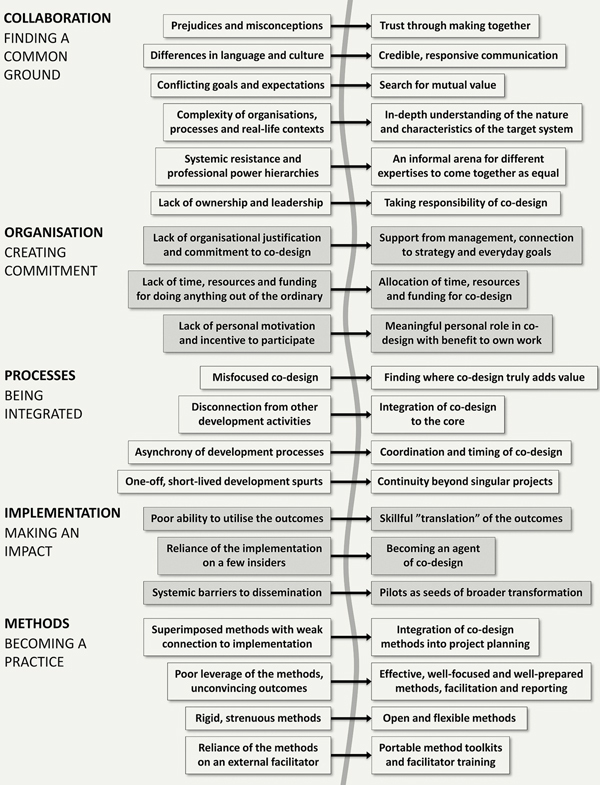 Junginger and Sangiorgi (2009, see also Sangiorgi, 2011) emphasise that design is inseparable from organisational change and can operate in an organisation in many ways and depths. Similarly, Meroni and Sangiorgi (2011, p. 202-204) note that service designers can work on different levels (from operational to strategic) and with varied methods and aims, ranging from designing interactions to exploring new service models and imagining future directions for service systems. Within service systems and networks, co-design can facilitate the identification of user needs and shared innovation processes (e.g., Cottam & Leadbeter, 2004). However, companies have been slow in adopting co-design because it threatens existing professional hierarchies, is antithetical to consumerism and is considered an academic effort with little business relevance (Sanders & Stappers, 2008). In the public sector, fear of novelty, avoidance of risks and prejudices towards unconventional methods may hamper service design experiments (Bason, 2014; Kurronen, 2014). When aiming at embedding co-design for services in organisations, building design capability over time and sustainable co-design practices would be more beneficial than short-term interventions (Bailey, 2012). It should also be recognised that organisations are on a different maturity level regarding the utilisation of design (Brown, 2009). Moreover, each organisation has its individual “design legacy” that determines present solutions. This needs to be understood for new solutions created through the collaborative process to be adopted (Junginger, 2014). Steen, Manschot, and De Koning (2011) identify three types of benefits of co-design in service design projects: co-design can benefit the design project itself by increasing knowledge relating to user needs and by triggering better design ideas, can benefit the service’s customers by leading to services that match better their needs, or co-design can benefit the participating organisation(s) by improving cooperation between people and disciplines or by enhancing innovation practices. Aside from practice, co-design can affect the actors’ thinking (mindset) e.g. by making them understand the value of co-creation and the importance of empowering external stakeholders and customers (Suominen & Pöyry-Lassila, 2013). Methods play a crucial role in crossing design boundaries and reconciling differences in cross-organisational service networks. In contrast to traditional development work, co-design for services is supported by inspirational visual methods and tools, design games, graphic representations and artefacts that facilitate the sharing of user knowledge, the negotiation of controversies, the generation of new solutions and rapid experimentation (Ehn, 1988). The representations by designers (personas, scenarios, concepts, process maps, etc.) can become effective boundary objects (Carlile, 2002). Vaajakallio, Lee, Kronqvist, and Mattelmäki (2013, p. 8) state that explorative, provocative “design thinking and making” can challenge established viewpoints and practices and reveal unrecognised solution opportunities. The co-design approach provides “a platform for public sector representatives and citizens to physically meet, share and negotiate their perspectives” and supports the creation of trust. Empathic methods bring the citizens into the centre of service development and help non-designers in articulating their ideas. As prerequisites of co-design, Vaajakallio et al. stress the design maturity of the organisation and the importance of committed “change agents” who spread the outcomes in the organisation and build co-design skills internally (as also suggested by Levina & Vaast, 2005). Regarding practical barriers and enablers of co-design, Dutch researchers (Kleinsmann, Valkenburg, & Buijs, 2007; Kleinsmann & Valkenburg, 2008) have studied the factors that support or hamper the creation of a shared understanding in co-design. Their cases are from the automotive industry and are limited to the perspective of the design team. They identify factors that influence the effectiveness and quality of co-design on three levels. On the actor level, the most important factors are the actors’ ability to transfer knowledge and the equality of the language, on the project level the efficiency with which information is processed and the quality of project documentation, and on the company level the organisation of resources and the allocation of tasks and responsibilities. Analysing one of the case projects in this article, Hyvärinen, Lee, and Mattelmäki (2015) identified the complexity and fragmentation of services, top-down thinking and a lack of organisational support for building new networks as main barriers to cross-organisational collaboration in developing services for the elderly in an urban area. They pinpoint that aside from customer-centredness, it is crucial to develop methods and practices for facilitating actual collaboration between actors in a particular context. In summary, research on cross-organisational (service) co-design, largely in line with the research on collaboration in general, highlights organisational hierarchy and culture as the main barriers to co-design, and shared user focus, openness and inspirational, experimental methods as the main enablers of co-design. The existing research, however, is rather general in its outcomes or limited in scope. A more systematic “typology” of hindering and supporting factors across cases has been missing. This article seeks to fill in the gap through an analysis of empirical data covering an array of different types of service co-design projects in the fields of technology, healthcare and education. The study material derives from a trans-disciplinary research project called “ATLAS: Map for Future Service Co-development” (2012–2014). The project aimed at developing a “big picture” of service co-development methods through an analysis of 13 university-led applied research projects in Finland with different theoretical starting points and in different service contexts. The selection criteria used for focusing on these particular studies included their focus on cross-organisational service development, their use of designerly methods and access by the researchers to the project data. The follow-up interviews used as material in this paper focus on six of the case projects, carried out between 2006 and 2012 by two research units from the fields of industrial design and industrial engineering and management (see also Table 1). Table 1. Comparison of the case projects. 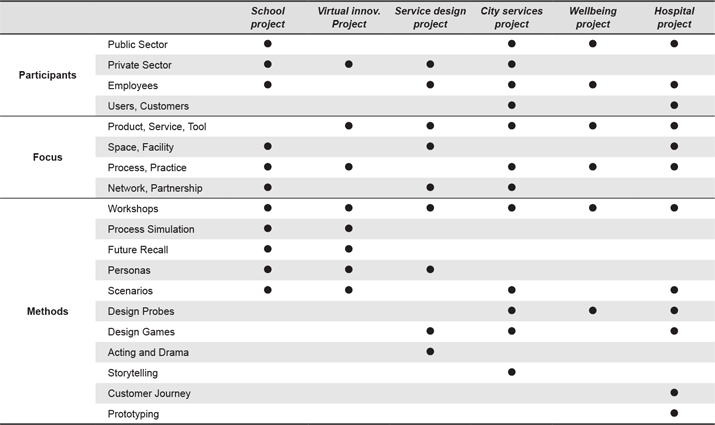 The School Project (interviews 1­–8) studied the collaborative public-private service innovations in the “extended teaching processes” of comprehensive schools, developing new, networked service concepts and business models of the “extended school”. The project had several cases focusing on different schools. The interviews mostly deal with a case that focused on the merger of two schools in Helsinki. The project was conducted by a research unit in industrial engineering and management. The partners included several schools, the city and companies. The methods that were used included process simulation, future recall, personas and scenarios. The Virtual Innovation Project (interviews 9–12) was designed to develop innovation processes and practices and new ways of co-creating ideas. It focused on the internal service development of a pilot company’s innovation processes and related digital tools. The process of introducing a new software for submitting ideas was studied and ways to improve its adoption were sought in collaboration with employees. The project was led by a global technology manufacturing corporation and was overseen by a research unit in industrial engineering and management. The methods included process simulation, future recall, personas and scenarios. The Service Design Project (interviews 12–13) explored service co-design as a strategic means for building novel business partnerships, for promoting the pilot company’s willingness to understand their end users, and for communicating its new user-centred slogan within the organisation. The interviews focus to a case concerning the recognition of novel partnership possibilities between three companies in senior housing. The project was led by the same technology corporation that was involved in the Virtual Innovation Project and was overseen by a research unit in industrial design. The methods included design games, personas and acting and drama. The City Services Project (interviews 14–16) looked at the application of human-centred co-design and service design methods in the development of public services provided by the city. The partners included the city (who also funded the work), healthcare service providers and a consulting firm. The interviews deal with a pilot focusing on the development of customer-centred networked service models for carer families within an urban neighbourhood. The co-creation part in the project was realised by a research unit in industrial design. The principal methods were design probes, design games, storytelling and scenarios. The Wellbeing Project (interviews 17–18) dealt with the co-design of human-centred wellbeing and healthcare services together with municipalities. The interviews are from a case focusing on the development of psychiatric treatment environments and services in public healthcare. The case was realised as a study project by a multi-national group of students of industrial design. Design probes and co-design workshops were the main methods. The Hospital Project (interviews 19–23) aimed at bringing forth the needs of the patients for improving and designing patient-centred healthcare services in a university hospital. The first phase aimed at improving the patient service and patient experience of sarcoma-type cancer patients through design research. The second phase focused on prototyping the future work, care and recreation spaces in the hospital with the help of a cardboard model. The project was realised by researchers in industrial design with personnel in the pilot hospital. Design games, customer journey, scenarios and prototyping as well as a design probes type task were utilised. As seen, the case projects represent a broad array of topics, objectives, actors and approaches. Four projects were situated in the public sector, either education (the School Project) or healthcare services (the City Services Project, the Wellbeing Project and the Hospital Project). Two projects were industry-led, incidentally by the same large technology company. Regarding the facilitator side, the projects divide into those grounded in industrial engineering and management (the School Project and the Virtual Innovation Project) and those driven by the design discipline (the Service Design Project, the City Services Project, the Wellbeing Project and the Hospital Project). The participants to the collaborative activities were representatives of the client organisations, typically people in managerial and development roles (see Table 2). Also other personnel, such as teachers in the School Project and nurses in the Hospital Project, were involved. External users participated in the City Services Project (seniors and home carers) and in the Hospital Project (patients). However, in most projects some methods for bringing in the user perspective were used. Importantly, the focus and scale of development also varied, ranging from the improvement of a web-based tool (Virtual Innovation Project) to the development of the spatial solution and operations of a new hospital unit (Hospital Project), and to the creation of a new service model and network of actors supporting home care (City Services Project). Some of the projects focused more on the physical space while in others the intangible service or the network was emphasised. The wealth of foci in the projects necessitates a broad definition of service. The School Project approached the school as a service. The Virtual Innovation Project developed a digital service. The Service Design project targeted services for senior housing. The City Services Project, the Wellbeing Project and the Hospital Project focused on healthcare and related services. Along the lines of Meroni and Sangiorgi (2011), all can be described as design for services. All projects included what can be called service co-design interventions (Suominen & Pöyry-Lassila, 2013), that is, short-term collaborative development activities led by researchers where the object of development was conceptualised broadly as a service and where creative and collaborative methods were utilised. The methods are summarised in Table 1. As a general distinction, the two projects led by the industrial engineering research unit relied on specific methods for creating visualised process models (business process simulation) and common visions of the future (future recall). The future recall method was originally developed for facilitating network dialogue in social services (Seikkula, Arnkil, & Eriksson, 2003). It is based on imagining a desired future and “reconstructing” the path to it from the present. The design-led projects utilised more experimental and user-centred methods, including design probes for gathering contextual user knowledge (see Mattelmäki, 2006), design games (see Vaajakallio, 2012) and storytelling/acting. Actual service design methods (customer journey mapping and elementary service prototyping) were only used in the Hospital Project. The concrete outcomes of the projects varied. The researchers mostly contributed to the overall goal indirectly by providing user knowledge, design guidelines, development ideas, concepts and scenarios. Implementation and real-life design decisions were left to the clients. During the projects, the researchers produced reports, presentations, diagrams, other visual material and tangible artefacts such as rapid prototypes or mock-ups, design games and other co-design tools. Various terms were used in the projects for describing the collaborative activities, namely co-design, co-creation and co-development. The interpretations of the two first notions have been discussed by Mattelmäki and Sleeswijk Visser (2011), who conclude that from within the design field, co-design can be seen as the overall approach within which specific co-creation activities take place to harness the collective creativity of the actors. In line with them and to anchor the work to design studies, the term co-design for services is used here regardless of variation in the sources. Co-design in the projects was not primarily participatory design, even if users or customers were involved, but rather designers working as facilitators in cross-organisational networks, enabling people from different backgrounds to work together towards a common goal. The co-design project and its impacts: Own role and role of others; the goals of the project; outcomes and development ideas based on the project; implementation of the results. The methods, tools and artefacts used in co-design: Experiences of using specific methods; their advantages and disadvantages; later adoption of methods in own work or organisation. Present utilisation of co-design: More general discussion on the nature and challenges of co-design and other development activities from the interviewee’s perspective. In total, 23 interviews were conducted by four researchers. They lasted from about one to two hours. One interview was with a group of three persons (1, 2, 3) and one with two persons (20, 21). Written transcripts of the interview recordings have been used as primary sources in the analysis. 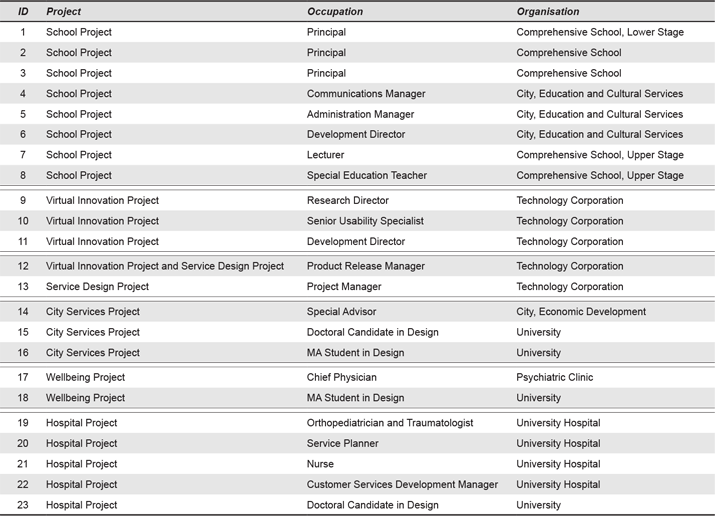 The distribution of the interviewees according to project, their occupation and organisation is shown in Table 2. There were eight interviewees from the School Project, three from the Virtual Innovation Project, two from the Service Design Project (of whom one had also participated in the Virtual Innovation Project), three from the City Services Project, two from the Wellbeing Project and five from the Hospital Project. Among the participants were 14 public sector employees (five teachers, five healthcare professionals and four city development officers), five company representatives and four researchers or students who had worked as facilitators in the projects. For this paper, the complete collection of interview data were analysed by the author with the aim of identifying barriers and enablers. The starting point was a hypothesis based on existing research about the role of supporting and hindering factors in co-design. The analysis method was mainly content-driven. The aim was to look for occurrences of perceived barriers and enablers in the data without a preconceived framework. The results could then be reflected against previous research. The method for eliciting the barriers and enablers can be described as factoring (Miles & Huberman, 1994). In the first phase, the interview transcripts were read closely by the author and all instances that could be interpreted as a barrier or enabler were marked in the text. Some of the barriers and enablers were explicitly mentioned by the informants while others were more implicit in the material. At this point, all articulated or implied barriers/enablers were considered. In the second phase, the large number of identified barriers/enablers were categorised according to affinity. This led to the emergence of broader categories dealing with certain themes or aspects of co-design. In general, a category was included if there was evidence for it from multiple informants. Marginal or weak categories were left out or combined into others. In the third phase, the categories, each comprising many singular examples of barriers/enablers from the material, were further reduced and generalised into more abstract factors. The resulting higher-level barriers and enablers were described and named to crystallise their core content. To test accuracy, they were also discussed with the researchers who initially conducted the interviews. During the analysis, it became evident that many of the identified barriers and enablers seemed to mirror each other. An enabler could be seen as the solution to a barrier. This led to the forming of barrier–enabler couples. However, the correspondence between a particular barrier and enabler may sometimes be a bit forced. More research would be needed on their interconnections. Moreover, the results mainly reflect the participants’ subjective experience. Many of the participants were also proponents of co-design in their organisation, which may have induced a bias towards overt positivity. Several articles making use of some parts of the interview data have been published previously (Hyvärinen et al., 2015; Suominen & Pöyry-Lassila, 2013; Vaajakallio et al., 2013). This paper is the first to provide a comprehensive cross-case analysis. The main results are presented in the following two sections. A tension concerning the impacts and outcomes of co-design emerged in the interviews (see Figure 1). In terms of outcomes, it seems that a service co-design project conducted by a university easily remains a superimposed one-off activity with weak connection to actual end solutions and with relatively little value or impact on the participating organisations’ core activities, aside from a change of mindset towards more user orientation or some incremental development ideas. More sustained co-design that would truly add value for the organisations seemed difficult to attain. The perceived impacts of the co-design projects would be the topic of another paper. Here, the tension provides a starting point for understanding the barriers and enablers in co-design that influence effectiveness of the projects. Figure 1. The tension in co-design for services. In the material, the participants brought up some barriers, that is, constraining factors that hindered the success of co-design for services and eroded collaboration in the projects. They also discussed various enablers that contributed to making the project succeed. 20 barrier–enabler couples could be deduced from the interviews (see Figure 2). They relate to the broader themes of collaboration, the organisation, processes, the implementation of outcomes and the co-design methods. The barriers and enablers offer an overview of some of the critical issues and challenges faced by professionals undertaking service co-design (see also Kleinsmann et al., 2007; Hyvärinen et al., 2015). Figure 2. The barriers and enablers of co-design for services. The barrier-enabler couples are described in greater detail below. There is a short description of each complemented by examples and quotes. The first chapter describes the barrier and the second chapter the corresponding enabler. The numbers in brackets refer to the interviews in which the particular barrier/enabler came up (see Table 2). They are included for reasons of transparency and to allow the reader to go into more detail regarding the experiences of specific actors. The term facilitator refers to the researchers or students who planned and realised the co-design activities. The first six barrier-enabler couples (1–6) describe the general prerequisites of cross-organisational collaboration: the creation of trust, overcoming cultural differences, finding shared value, dealing with hierarchy and complexity and taking responsibility for collaboration. The second theme that emerged from the data (barrier-enabler couples 7–9) addresses the commitment of organisations and individuals to co-design work, an issue also brought up in previous research (e.g., Axelsson & Axelsson, 2006; O’Flynn, 2014; Widmark et al., 2011). The third set of barriers and enablers (10–13) deals with the targeting and coordination of service co-design activities in relation to other processes in the participating organisations. The implementation of the results of university-led service co-design efforts by service development networks and organisations presents the fourth theme (barrier-enabler couples 14–16). Finally, four barrier-enabler couples (17–20) could be detected that relate to the viability of the specific methods used in the service co-design interventions. Consideration of them could support the diffusion of co-design in organisations and its development into a sustained practice. Co-design methods should be effective, well focused and well prepared and deliver outcomes in a format that is useful for the client organisation. Some methods in the case projects were more credible than others. Design probes and customer journey mapping for example proved to be useful in the healthcare sector and visualised user personas in the technology company. Design games and visual material facilitated collaboration and acted as sources of inspiration. It was stated that visualisations “carry through thick piles of paper”, make visible key issues and act as points of discussion. Level of realism and connection to design solutions in methods were deemed beneficial. The 20 barriers and corresponding enablers of co-design for services elicited from the data (Figure 2) consolidate the findings of previous research but also add some detail to the picture. The interviews showed obstacles in cross-organisational collaboration and in implementation of project ideas, misuse of co-design methods, and problems in integrating co-design projects with other projects. The results highlight the importance of well-chosen methods and professional facilitation as well as the role of “change agent” participants as success factors in co-design for services. In the light of the study, co-design for services across organisations and disciplines requires the building of trust, the reconciliation of divergent goals and a search for mutual value. The participating organisations’ core purpose and operations, history, design maturity, organisational structure, power hierarchy and culture and the responsibilities, skills and interests of the participants affect how co-design is realised. Its benefits can be lost through poor management, a lack of resources or incentives, conflicts, a wrong focus or timing, discontinuity, or the inability to utilise the outcomes. An unfamiliarity with co-design can create resistance and weak methods lead to disappointment. It also seems that designers are not always capable of articulating the potential of their methods. As a limitation, the study relies on the subjective experiences of relatively few persons, many of whom were advocates of co-design in their organisation or were themselves researcher-facilitators in the projects. On the other hand, the study can also be considered valuable because it opened up the perspectives of both the clients and those who planned and executed co-design activities. The results also remain on a rather practical level. They should be validated further in reflection with theory. For instance, many of the barriers and enablers could arguably be found in any design project or cross-organisational collaboration. Their design for specific service aspects should be investigated further. The reliability and validity of the study could have benefited from data triangulation and an analysis by more than one person. However, the findings were assessed with other researchers in the project and in the light of existing research. Finding a common ground for co-design requires mutual communication to create trust, facilitation of collaboration, and making things with others. Providing an informal arena for people to come together as equals can support this. To make an impact, the designer-facilitators should command the process confidently and know their target system. Creating commitment to co-design in organisations and among individuals can be enabled by management, e.g. through allocation of time, resources and funding for co-design activities and recognition of co-design as an integral part of the operation. Employees should also be helped in finding themselves a meaningful role and incentives to commit to the project. To enhance the integration of service co-design activities with other development processes, organisations should find where co-design truly adds value, embed co-design activity closer with their core operations, put effort into the coordination and timing of all development processes, and seek for ways to ensure the continuity of development beyond one-off projects. For service co-design projects to succeed, their outcomes need to be translated to the language and needs of the client organisation. In line with previous research, it seems that committed individuals acting as “agents of co-design” have a key role in implementing the results, bringing the message further and working for the diffusion of methods in their own organisation or network. Moreover, tangible, designerly pilots and rapid prototypes can act as vehicles of transformation. Service co-design methods should be integrated already in the project planning phase and be well focused and effective, yet open to respond to unexpected situations in real-life contexts. Wider adoption of the methods could be supported by portable method toolkits and training. The barriers and enablers described in this paper offer some insights for making the practice of co-design for services more viable. As described in this paper, the major challenge in research-driven service co-design projects was a disconnection from “real” development and implementation. However, despite initial doubts, the professionals in city administration, healthcare, education and technology came to value the co-design approach because of its holisticity. It made possible the sharing of experiences across boundaries where the users were also given a voice. The author would like to thank the research team in the ATLAS project, particularly Anna Salmi, Jung-Joo Lee, Svante Suominen and Sanna Tuononen who planned and conducted the follow-up interviews. Thanks are also due to the Finnish Funding Agency for Innovation for funding the work and to Professor Tuuli Mattelmäki for commenting on the manuscript. Axelsson, R., & Axelsson, S. B. (2006). Integration and collaboration in public health: A conceptual framework. International Journal of Health Planning and Management, 21(1), 75-88. Bason, C. (Ed.). (2014). Design for policy. Farnham, UK: Gower. Bruneel, J., D’Este, P., & Salter, A. (2010). Investigating the factors that diminish the barriers to university-industry collaboration. Research Policy, 39(7), 858-868. Carlile, P. R. (2002). A pragmatic view of knowledge and boundaries: Boundary objects in new product development. Organization Science, 13(4), 442-455. Cottam, H., & Leadbeater C. (2004). Health: Co-creating services (RED paper 01). London, UK: Design Council. Fuad-Luke, A. (2012). Co-designing services in the co-futured city. In T. Kuosa & L. Westerlund (Eds. ), Service design: On the evolution of design expertise (pp. 101-120). Lahti, Finland: Lahti University of Applied Sciences. Gagliardi, P. (1986). The creation and change of organizational cultures: A conceptual framework. Organization Studies, 7(2), 117-134. Gray, B. (1989). Collaborating: Finding common ground for multiparty problems. San Francisco, CA: Jossey Bass. Hansen, M. T., & Nohria, N. (2004). How to build collaborative advantage. MIT Sloan Management Review, 46(1), 22-30. Huxham, C. (1996). Collaboration and collaborative advantage. In C. Huxham (Ed. ), Creating collaborative advantage (pp. 1-18). London, UK: Sage. Hyvärinen, J., Lee, J. -J., & Mattelmäki, T. (2015). Fragile liaisons: Challenges in cross-organizational service networks and the role of design. The Design Journal, 18(2), 249-268. Junginger, S. (2014). Design legacies: Why service designers are not able to embed design in the organization. In Proceedings of the 4th Conference on Service Design and Service Innovation (pp. 164-172). Lancaster, UK: Lancaster University. Kanter, R. M. (1994). Collaborative advantage: The art of alliances. Harvard Business Review, 72(4), 96-108. Keinonen, T., Vaajakallio, K., & Honkonen, J. (Eds.). (2013). Designing for wellbeing. Helsinki, Finland: Aalto University School of Arts, Design and Architecture. Kimbell, L. (2009). The turn to service design. In G. Julier & L. Moor (Eds. ), Design and creativity: Policy, management and practice (pp. 157-173). Oxford, UK: Berg Publishers. Kleinsmann, M., Valkenburg, R., & Buijs, J. (2007). Why do(n’t) actors in collaborative design understand each other? An empirical study towards a better understanding of collaborative design. CoDesign, 3(1), 59-73. Kleinsmann, M., & Valkenburg, R. (2008). Barriers and enablers for creating shared understanding in co-design projects. Design Studies, 29(4), 369-386. Kurronen, J. (2014). Muotoilu osana julkisen sektorin innovointia [Design as part of the innovation system in the public sector]. In A. Jyrämä & T. Mattelmäki (Eds. ), Palvelumuotoilu saapuu verkostojen kaupunkiin [Service design arrives to the city of networks] (pp. 29-51). Helsinki, Finland: Aalto University School of Arts, Design and Architecture. Lusch, R. F., & Vargo, S. L. (2006). Service-dominant logic: Reactions, reflections and refinements. Marketing Theory, 6(3), 281-288. Mager, B. (2008). Service design. In M. Erlhoff & T. Marshall (Eds. ), Design dictionary: Perspectives on design terminology (pp. 354-357). Basel, Switzerland: Birkhäuser. Mattelmäki, T. (2006). Design probes (Doctoral dissertation). Helsinki, Finland: University of Art and Design Helsinki. Mattelmäki, T., & Sleeswijk Visser, F. (2011). Lost in co-x: Interpretations of co-design and co-creation. In N. Roozenburg, L. -L. Chen, & P. J. Stappers (Eds. ), Proceedings of the 4th IASDR Conference on Design Research [CD Rom]. Delft, The Netherlands: TU Delft. Meroni, A., & Sangiorgi, D. (Eds.). (2011). Design for services. Farnham, UK: Gower. Mintzberg, Y., & Mintzberg, H. (1988). Strategy making as craft. In K. Urabe, J. Child, & T. Kagono (Eds. ), Innovation and management: International comparisons (pp. 167-196). New York, NY: Walter de Gruyter. O’Flynn, J. (2014). Crossing boundaries: The fundamental questions in public management and policy. In J. O’Flynn, D. Blackman, & J. Halligan (Eds. ), Crossing boundaries in public management and policy: The international experience (pp. 11-44). London, UK: Routledge. Robbins, S. P. (1991). Organizational behavior: Concepts, controversies, and applications (5th ed.). London, UK: Prentice-Hall International. Sanders, E. N., & Stappers, P. J. (2008). Co-creation and the new landscapes of design. CoDesign, 4(1), 5-18. Sangiorgi, D. (2011). Transformative services and transformation design. International Journal of Design, 5(2), 29-40. Schein, E. H. (1985). Organizational culture and leadership. San Francisco, CA: Jossey-Bass Publishers. Seikkula, J., Arnkil, T., & Eriksson, E. (2003). Postmodern society and social networks: Open and anticipation dialogues in network meetings. Family Process, 42(2), 185-203. Star, S. L., & Griesemer, J. R. (1989). Institutional ecology, ‘translations’ and boundary objects: Amateurs and professionals in Berkeley’s museum of vertebrate zoology. Social Studies of Science, 19(3), 387-420. Steen, M., Manschot, M., & De Koning, N. (2011). Benefits of co-design in service design projects. International Journal of Design, 5(2), 53-60. Stickdorn, M., & Schneider, J. (Eds.). (2010). This is service design thinking: Basics – tools – cases. Amsterdam, the Netherland: BIS Publishers. Suominen, S., & Pöyry-Lassila, P. (2013). Effectiveness of co-design intervention: Adopting service co-development thinking. In R. Smeds & O. Irrmann (Eds. ), Proceedings of the Conference on Co-design in Innovation (pp. 697-708). Espoo, Finland: Aalto University, School of Science. Till, J. (2005). The negotiation of hope. In P. Blundell-Jones, D. Petrescu, & J. Till (Eds), Architecture and participation (pp. 23-41). London, UK: Spon Press. Vaajakallio, K. (2012). Design games as a tool, a mindset and a structure (Doctoral Dissertation). Helsinki, Finland: Aalto University School of Arts, Design and Architecture. Widmark, C., Sandahl, C., Piuva, K., & Bergman, D. (2011). Barriers to collaboration between health care, social services and schools. International Journal of Integrated Care, 11, e124.